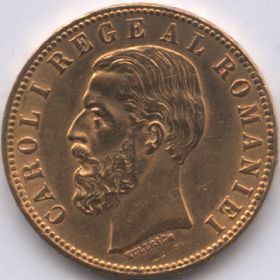 denomination "20 LEI", year 1883, Romanian coat of arms, letter B and wheat ear, the signs of Romanian mint, outer pearl circle inscription "CAROL I REGE AL ROMANIEI" meaning "KING OF ROMANIA" and CAROL I head facing left, outer pearl circle. Under the neck lies KULLRICH, the engraver's name. 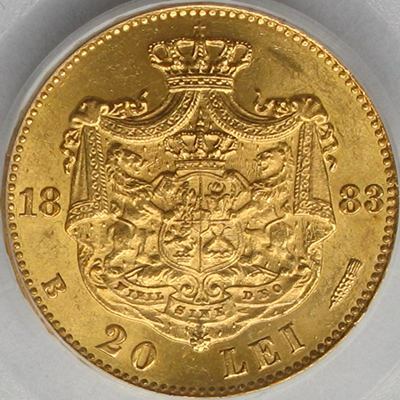 Mintage for these gold coins: 150.000 in 1883, 35.290 in 1884 and 196.000 in 1890. The coins minted in 1884 bear the year 1883. 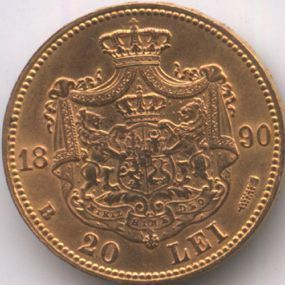 The 20 lei 1883 gold coin pictures above are present on Romanian coins through the kind permission of an anonymous donor. 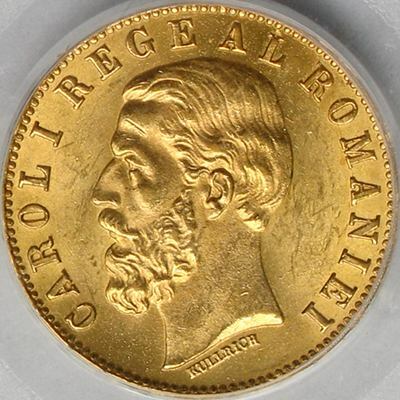 The 20 lei 1890 gold coin pictures above are present on Romanian coins through the kind permission of Mr. Lazăr Florin.